The S.S. VIRGINIA V sailed her maiden voyage on June 11, 1922, as part of the Puget Sound Mosquito Fleet. The Mosquito Fleet was the first regional ferry system, connecting coastal towns around South Puget Sound. Steamships transported people between growing port cities of Seattle and Tacoma and moved crops and livestock from farms on Vashon Island. The VIRGINIA V maintained the route between Seattle and Tacoma along the West Pass (also known as “Colvos Passage”) between Vashon Island and the Kitsap Peninsula from 1922 to 1938. 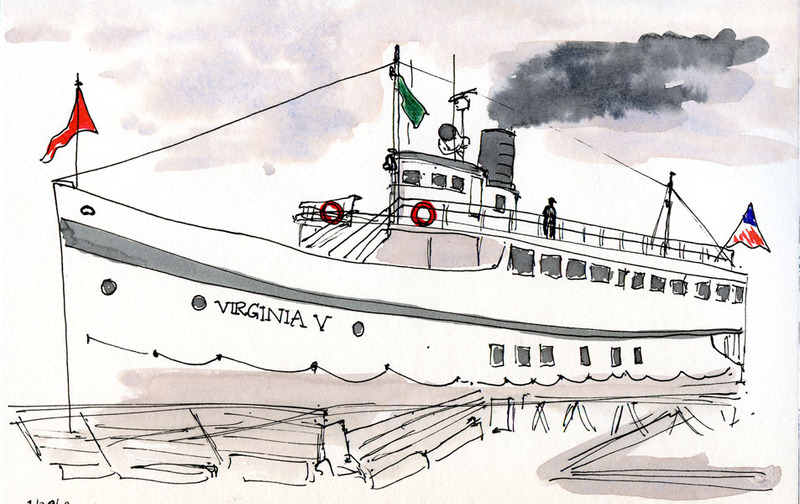 Today, the S.S. VIRGINIA V is the last operational example of a Puget Sound Mosquito Fleet steamer. Her all-wood construction and steam engine make her a National Historic Landmark vessel. Choose a topic below to learn more.